Ash + Misty.....Is It a Love Connection? Comments? Questions? Compliments or Flames? Ash & Misty -- Is it a Love Connection?? Since the release of the Pokémon TV series soundtrack, there have been many rumors going around about Ash and Misty's relationship in the Pokémon anime series. It becomes more evident as the series goes forward that Misty has taken more of a liking towards Ash. Below is a rundown of the more obvious points in the show where this relationship shows through. In the "Lavander Tower" episode when Ash "dies" as soon as he "resurrected" the first words out of his mouth are, "Misty!" Misty rubs the tears off her eyes and smiles blushing. What about Brock!? Ash doesn't seem to mind Pikachu always hanging around Misty. Except for that one time when Misty proved Pikachu not to be routy and then Ash defied saying he only obeys him when in fact that wasn't true...at the time. Misty *really* wanted Ash to use her Pokémon against Brock while he was gym leader. Though, Ash wanted to use the Pokémon he had trained. Misty kept asking him if he wanted to use her Pokémon, gosh she has her heart set on this doesn't she? In the episode "The Ultimate Test", after the test was finished (mostly after he beat Team Rocket) he reflected on some things that happened and Misty pointed out that he did learn something. And Ash nodded about that. Misty said some compliments and he thanked her and smiled. In the Squirtle Squad episode, when Ash comes back from getting the Super Potion for Pikachu, he worries about the Squirtle messing with Misty's hair color, they said they would. But when he returns, "So Misty you're still a red head?" He cares ^_^. In the episode where St. Anne sank, Ash wanted his Butterfree back. He talked with Misty about it, it was a *cute* scene. And when the boat started sinking and Ash ran after his Butterfree Misty and Brock followed as well. Though, Misty yelled, "Ash!!!!" While Brock just ran, no thoughts on Pikachu either. Misty: Come on ash, lets dance! Also, earlier in the same episode, when Ghastly started attacking with those skull ghosts, Misty grabbed tightly to Ash and the two were trying to figure out if there was a Pokémon located somewhere. In Primeape Goes Bananas, when Misty fell, Ash called out, "Wa, Misty!!!!!" In Pokémon Fashion Flash, when Misty saw the Salon Rockét (yes with the weird e), she linked arms with Ash and they ran off hand in hand. It was adorable! Also in Pokémon Fashion Flash, when Pysduck told Pikachu what happened to Misty, Pikachu "translated" it for Ash of course. Then Ash goes, "Waa, something bad happened to Misty?" And he leaps over the table and runs. Has to save his girl! Also in the Ninja Poké-showdown; when Misty was going crazy about Pysduck, Ash grabbed her and held her back. Jeez, those two held each other a lot in this episode. Also in that episode, when Ash says he'll go on without Misty, she continues to follow him. Ash asks why and Misty fumbles with her words... she wouldn't want to tell him the REAL reason just yet. She instead gives him the old "bike excuse"
In the Eevee episode, Ash and Misty did a lot of looking at each other. Not that big of a hint, it was like well we gotta look at each other 24/7. 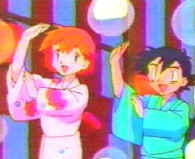 In the episode Princess Vs. Princess, when Misty was in her kimono in line with all the other contestants; Ash said, "Awww." Also in that episode; when Misty was battling, Ash was all, "Hang in there Misty!" He wants his girl to win, you can't blame him. And he kept giving her battle tips when she was fighting Lickitung like, "Misty use Bulbasaur!" At the end of Volcanic Panic, Misty went blank on the bike. And Ash didn't want her to remember. He wouldn't want his girl to remember now would he? In The Misty Mermaid, at the beginning Ash asks Misty what's wrong cuz she's worried about Horsea. Also in that episode, when they were waiting for the show to start, Ash says, "I can't wait to see Misty!" Also, Ash says Misty's pretty good as she does her dance with the Pokémon. Also, when Misty was battling, Ash compliments Misty on her Pokémon battle skills. Also, when Misty wins Ash goes, "Alright Misty!" Last, but not least... at the end Ash is all sweet talking Misty. In Clefairy Tales, Misty goes with Ash when Ash is going to save Pikachu. "Ash, I'm coming with you!" While Brock goes after Officer Jenny. Also in that episode when they jumped to the skyscraper, Misty was holding onto Ash. Not like she had a choice... it was just really cute. In The Battle of the Badge, when Gary's girls are all crying Misty says that thing about if she cried every time about Ash and so on. Then everyone is silent. Ash falls over in stupidity and goes, "She's only kidding!" So obviously Misty does care about when Ash loses... but not that she'd cry. Also in that episode, when Team Rocket took Ash, Misty was worrying for him; Mrs. Ketchum told Misty not to. Jeez, Misty worries more than the mom. Those are some of the more obvious points in the show where we are given hints that Misty really DOES like Ash. However, the major spoiler is the track from the first Pokemon soundtrack "2BA Master" called "Misty's Song" Listen to the song if you have the CD or read the lyrics....its very obvious here that Misty really likes....or should I say in the song's case....LOVES Ash, but it is difficult for Misty to get the right words out. Now if only the anime series would be that obvious. Ash & Misty -- It IS a Love Connection. All titles mentioned, and all likenesses (Character designs, logos, names, etc, etc.) related to them are copyrights of their respected owners as described in the Disclaimer page. This is a non profit fansite. No challenge of ownership has been made, so don't come suing me....I dont have that kind of money. This site: © 2001 "animefan25"